Some kids love adventure, and dream of being a hero. Ten-year-old Kyle Evans is not one of those kids, but when a giant hole appears in his bedroom and swallows his mom, a hero is what Kyle must become. Kyle sets out on the journey of a lifetime, and discovers along the way that Battle Droids are scarier than Search Droids, Kranken are more terrifying than either of these, and you should never stand still near a Burgly Bug. But more important than any of this, Kyle learns that sometimes a cat is not just a cat. Kyle Evans and the Key to the Universe is the first book in a quirky adventure trilogy that takes a boy, his cat and his friend Sofia across the universe, gradually revealing their amazing destiny. Rob H. Hunt is the author of Flicker and Kyle Evans and the Key to the Universe. 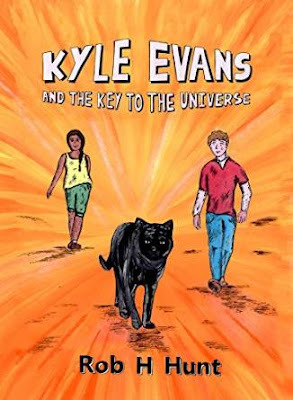 He loves to write stories about ordinary kids who find themselves in extraordinary situations, like Joel (FLICKER) who wakes up one day and discovers that nobody know who he is, or Kyle (KYLE EVANS AND THE KEY TO THE UNIVERSE) who learns that his cat is not really a cat at all. Rob loves to read (too many books to mention! ), watch TV, drive his bright red car (but not at the same time as reading or watching TV) and spend time hanging out with his family. Speaking of family, Rob lives in Connecticut with his wife, three sons and pet goldfish. I really enjoyed reading this book. My favourite character is Bootles because he is a funny cat. My least favourite character is the Commander because he wants to get Bootles. My favourite part in this book is when Kyle and Bootles get sucked into a hole in Kyle's bedroom. Then they find themselves in a spaceship. This book contained lots of robots trying to find Bootles because he is a main point/key to the storyline. This book was very easy to follow. It was pretty hard to put down because I really wanted to see what happened next.I rate this book 4.5 stars. I would recommend this book to my friends and kids around my age (9 yrs).